From the Colca Canyon to Machu Picchu, this 12-day itinerary takes you to Peru's major highlights. 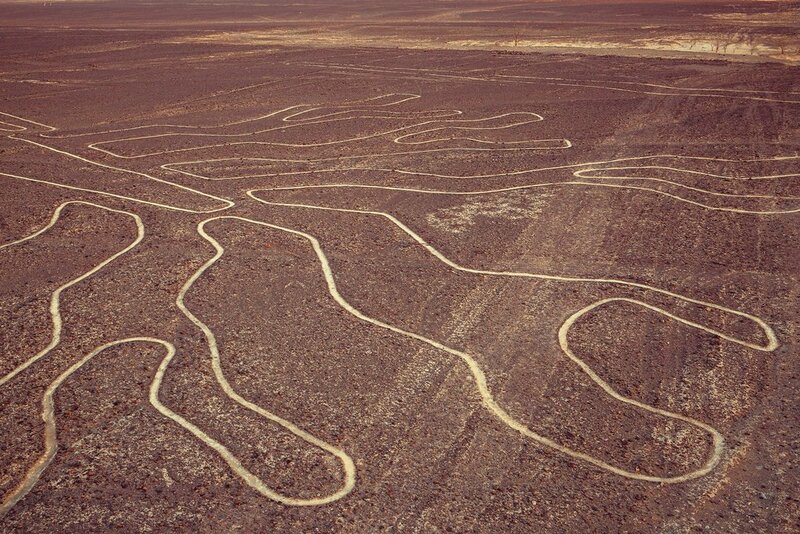 Fly over the Nazca Lines, some of the world's most impressive geoglyphs, before exploring Lima and the colonial city of Arequipa. Then visit Lake Titicaca, Cusco, and the Sacred Valley. 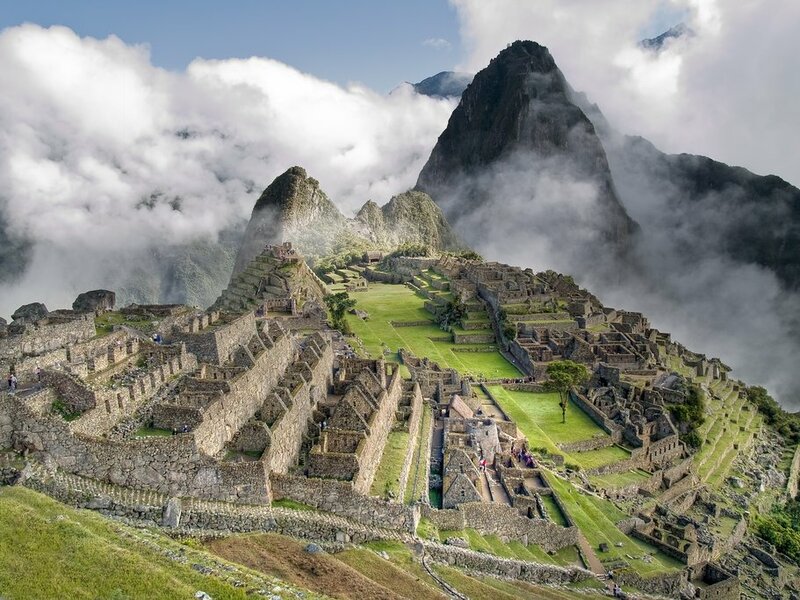 Cap off your trip by walking in the footsteps of the Incas on a short hike to Machu Picchu. Your day begins with a 6:30 AM pick up from your hotel in Lima, followed by a scenic 4-hour drive along the coast south to the seaside town of Paracas. After arriving, transfer to the nearby airport in Pisco. From here you will take a 90-minute flight south aboard a 12-passenger Cessna Grand Caravan to view the sprawling Nazca Lines. You will get a chance to see many of the most famous geoglyphs, including the hummingbird, dog, tree, whale, lizard, and more. After the flight head to Huacachina for an adventure in the desert sand dunes. Hop on a sandboard to surf down the larger dunes. In the evening, transfer to your hotel in Paracas. Today you will transfer from your hotel in Paracas back to Lima. Upon arrival, take the day to explore the city. 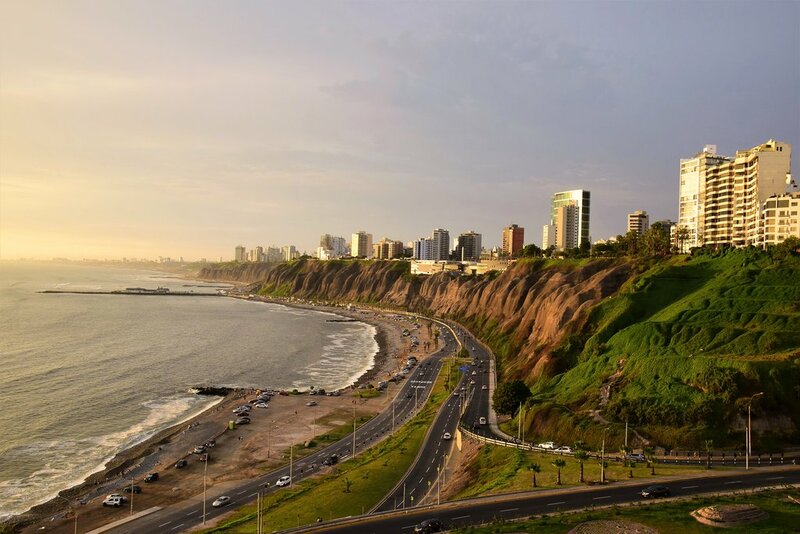 Lima's breezy location on the Pacific Ocean and mild desert climate make it the perfect city for exploring on foot. Head downtown to mingle with locals, stretch your legs, and grab a bite to eat in one of the many award-winning restaurants. This morning you will be transferred to the airport to catch the flight to Arequipa. Upon arrival in Arequipa, you will be greeted and taken to your hotel to settle in. In the afternoon, you will start your city tour with an escape to the past, walking through the Monastery Santa Catalina. Then continue the visit toward to the Compañia Church, famous because of its incredible baroque style and the colorful Cupula of Saint Ignacio. 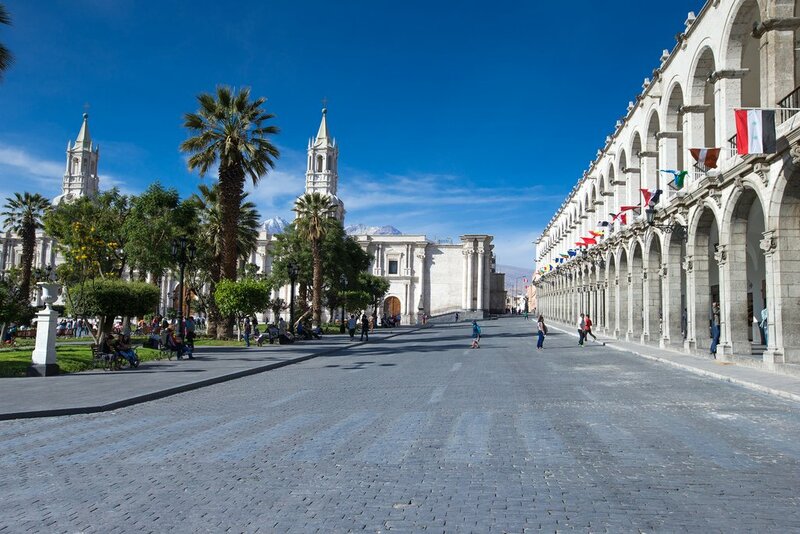 Then head to Arequipa’s Main Square, visiting its peculiar Cathedral with their Neo-renaissance style. After, head towards the traditional district of Yanahuara, with its beautiful plaza and views of the volcanoes Misti, Chachani and Pichu Pichu. 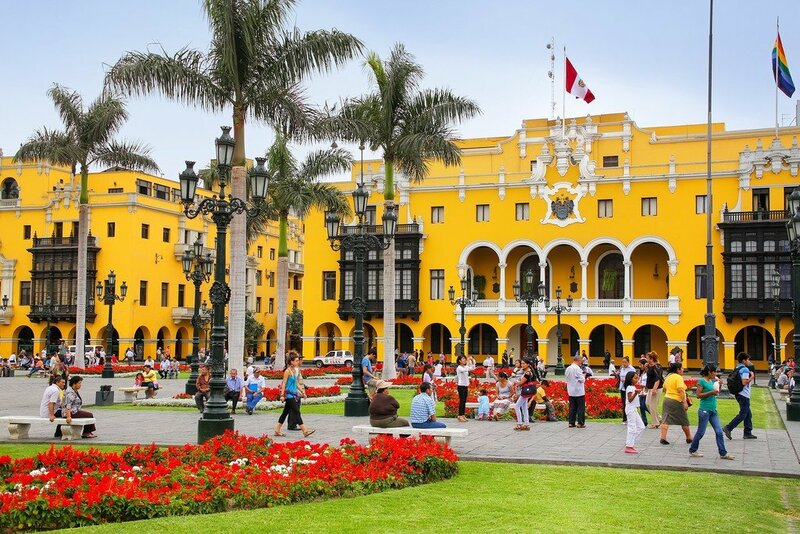 After your tour, head back to your hotel in Arequipa for the evening. Start the day early with a filling breakfast at your hotel in Arequipa before setting off on a scenic drive to Colca Canyon. This drive will last around 3 hours and will take you through spectacular high altitude landscapes. As the road climbs up to the Reserva Nacional de Salinas y Aguada Blanca, keep your eyes open for wild vicuñas (smaller cousins of the llama) and viscachas (small rodents that resemble rabbits). At the highest point of your journey, you’ll reach Patapampa Pass, located at a breathtaking 15,300 feet (4,820 m) above sea level. On the descent into the town of Chivay, you’ll begin to see pre-Inca agricultural terraces that characterize the landscape of the canyon. You’ll also see the Ampato, Sabancaya, and Misti volcanoes towering in the distance. In Chivay, you’ll visit the main square and stop for lunch. In the evening, transfer to your hotel in Cabanaconde to rest. Early this morning, you’ll meet your guide and drive to Mirador Cruz del Condor, one of the best viewpoints over the canyon and home to the famed condors that gracefully soar on the thermal currents. The road leads past picturesque villages and pre-Inca ruins dominated by the Ampato and Hualca glaciers, both visible in the distance. 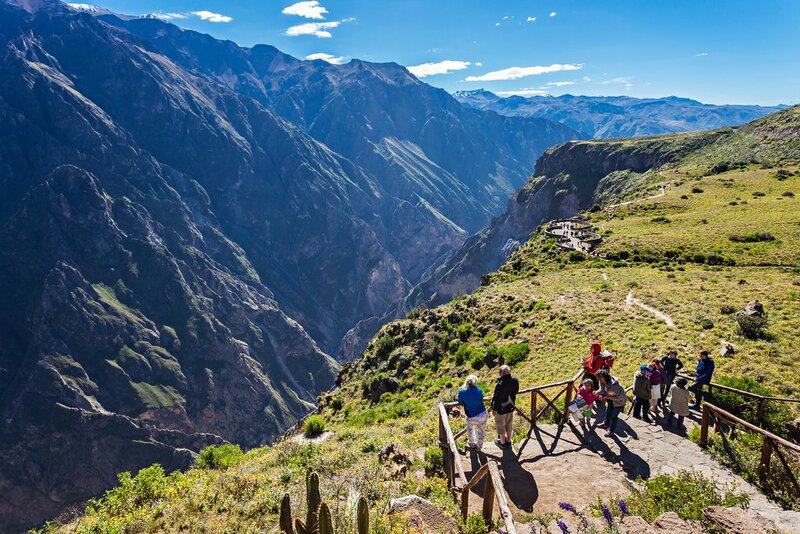 Once you reach Cruz del Condor, you can stand at the viewpoint and gaze into the depths of the canyon, which stretches nearly 4,000 feet below. You will return to Chivay where you can enjoy lunch and browse the local market before starting the journey by land to your Puno hotel. 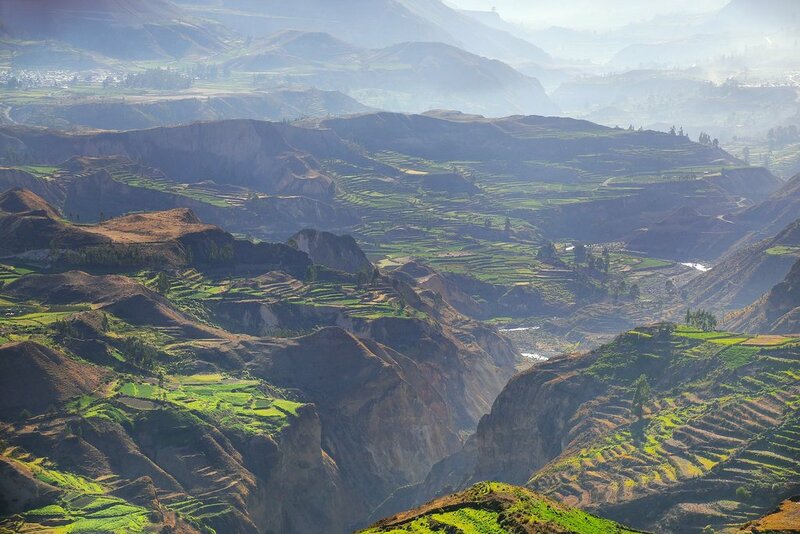 Puno is located 5-6 hours from Colca Canyon by car, and you will be able to enjoy spectacular views of the Andes on the way. Be sure to fuel up at breakfast this morning, as this full-day experience will last around 9 hours. Your first stop will be to one of the floating Uros islands. It is believed that the Uros were one of the first ethnic groups to populate the Andean region. 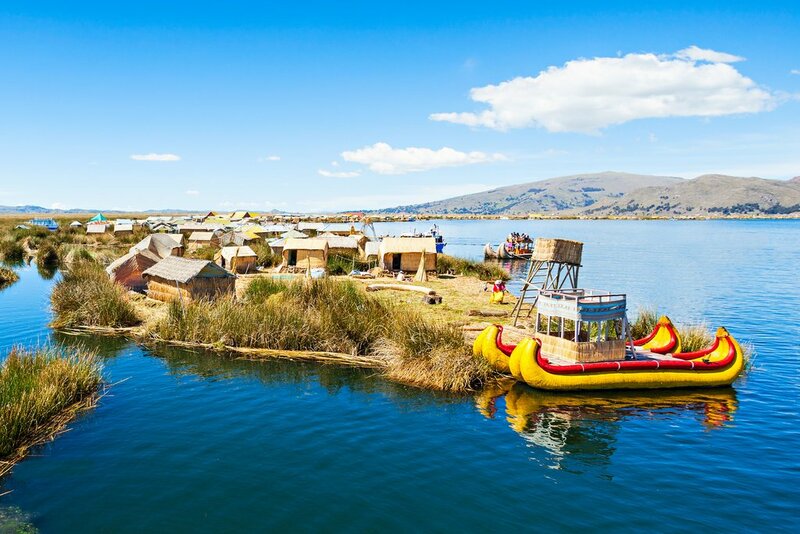 The Uros people live on man-made floating islands on Lake Titicaca. These islands are constructed out of the totora reeds that grow in abundance around the lake. During your visit to these islands, you'll learn about the everyday life and traditions of the Uros people. After your visit to the floating island, you'll head to lunch at a local restaurant on Taquile Island*. Quinoa soup, fresh fish caught in the lake, and vegetables are a typical lunchtime meal in Taquile. After lunch, we'll explore Taquile Island. This island remained mostly isolated from the outside world until the 1950s. As a result, the Taquileños follow a very different way of life. On the island, decisions are made communally, there are no cars, and there is very little electricity - just the way the Taquileños like it. Taquile is also famous for the exquisite weavings the locals produce. Traditionally, the men spin the thread, and the women design and weave each piece. You'll have the opportunity to learn about the lives and traditions of the Taquileños and appreciate the stunning views of Lake Titicaca from the island's shores. In the evening, walk back to the main dock in Taquile and board a boat back to Puno. Upon arrival in Puno, transfer to your hotel for the evening. *Note: Visiting Taquile requires a strenuous climb up 500 steps to the main part of the island. Elevation ranges from around 12,000 ft at the lakeshore up to 13,000+ ft at the highest point. In the morning, transfer to the Juliaca airport for your flight to Cusco. 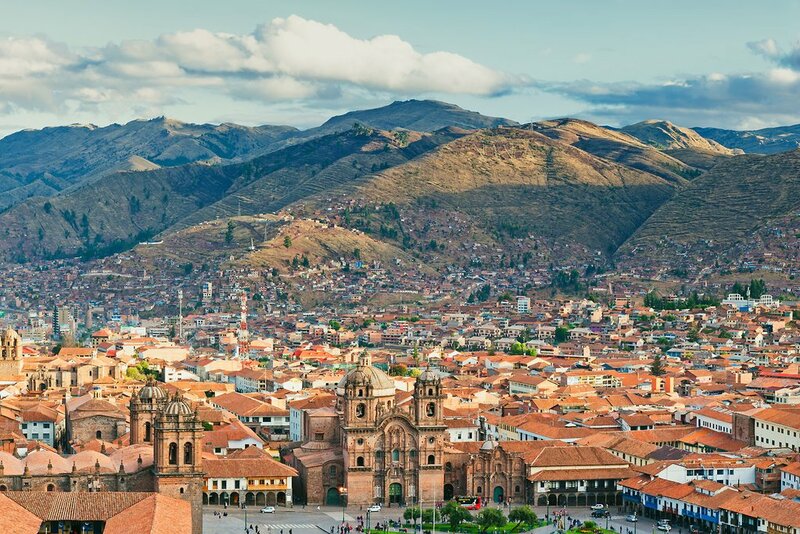 This ancient city is the former capital of the Inca empire, which reigned from the 13th to 16th centuries after conquering the Killke settlement on the same location. Experience the legendary Mercado Central de San Pedro, a large and diverse market famous for its mouth-watering fruit juices, home-style meals, medicinal herb stalls, and rows of various meats, bread, vegetables, and other necessities. 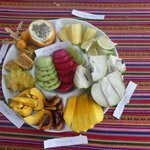 Eat dinner at a local Peruvian restaurant and sample local flavors and cooking techniques—crackling pork, pickled vegetables, seasonal flavors, bread baked in earthen ovens, roasted vegetables, and sweet donuts make for a delicious and filling meal. 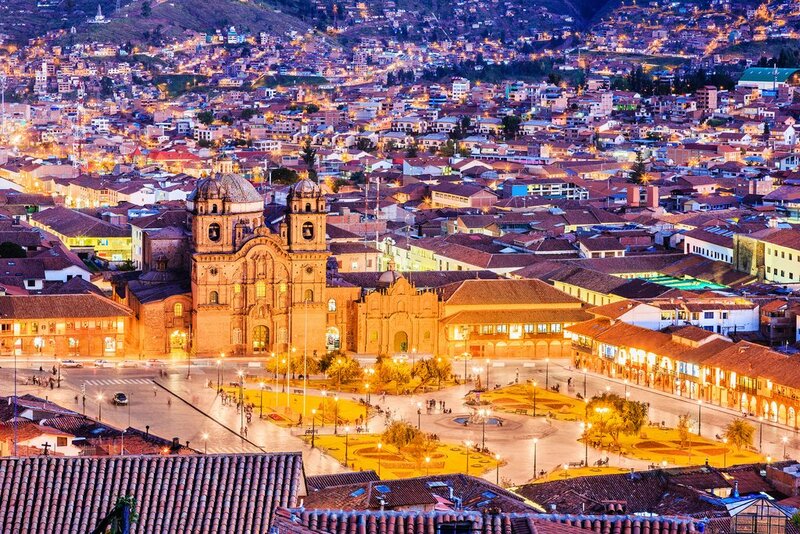 This morning you will depart from your hotel in Cusco and travel to the town of Chinchero, which the Inca believed to be the birthplace of the rainbow. 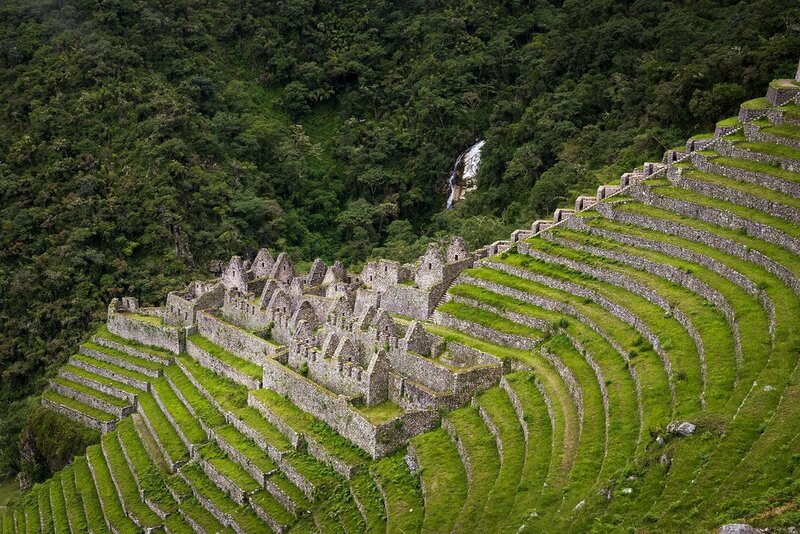 In this typical Andean village you can see extensive Inca terracing and some pretty colonial-era churches. The town is also known for its weaving studios – you'll have a chance to see the weavers producing handmade products. From Chinchero you'll continue to Moray, an incredible complex of stone amphitheaters developed by the Inca. While the exact reason for the construction of this site remains unknown, historians believe the Inca constructed in order to experiment with crop production in different micro-climates. 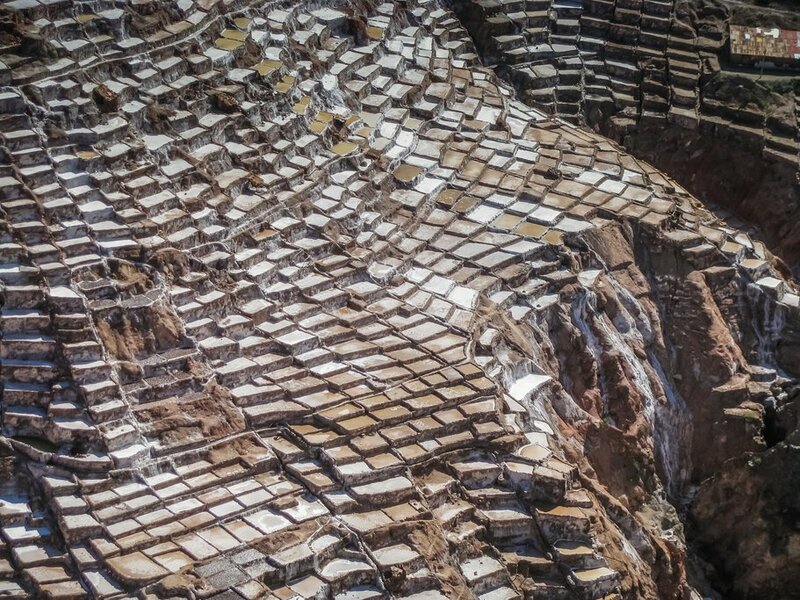 From Moray, you will walk through farmlands (or take a bus if you prefer) to Salineras, an incredible patchwork of stone pools and paths developed by the Inca as a means to harvest salt. Spend the night in Ollantaytambo, a historic town in the Sacred Valley, set on the Urubamba River, overlooked by massive stone fortresses. You'll have a chance to explore this charming village, its cobbled streets, and pretty central plazas. Early in the morning, we will take the train from Ollantaytambo to Km 104 where the short Inca Trail starts. By train, we see how the valley turns into a canyon and the scenery begins to alter as the cloud forests appear on our approach to Machu Picchu. We will disembark the train at Km 104 and start the hike along a challenging uphill path. Start the trek to your first archeological site—Chachabamba. This beautiful site is very well preserved thanks to its location in the valley and was likely used for religious purposes and as a gatekeeping point for this entrance to Machu Picchu. From here ascend for 3 hours to the ruins of Wiñay Wayna (2732 m / 8964 ft), an ancient rest area for travelers on the Inca trail. Here, we'll stop to enjoy our delicious boxed lunch, with superb views of the massive green mountains and native orchids. The trail then becomes gentler and continues through the semi-tropical cloud forest to Intipunku (Sun Gate) where you'll enjoy your first panoramic views of Machu Picchu. Descend half an hour to the citadel for a short break and an opportunity for photos. We won't be exploring the ruins today, as it will be getting dark. After passing through the Sun Gate, we'll cross the site to take the bus down to Aguas Calientes, where you'll check into our hotel to rest and relax in anticipation of a full-day visit to Machu Picchu tomorrow. Today is your last day in Peru! You will be met at your hotel for a transfer to Cusco Airport, where you will transfer to your international departure. ¡Buen viaje!